Candy’s Notes: All I gotta say is one word, “cats”. Not convinced? Idk then man, that should’ve hooked you right in! 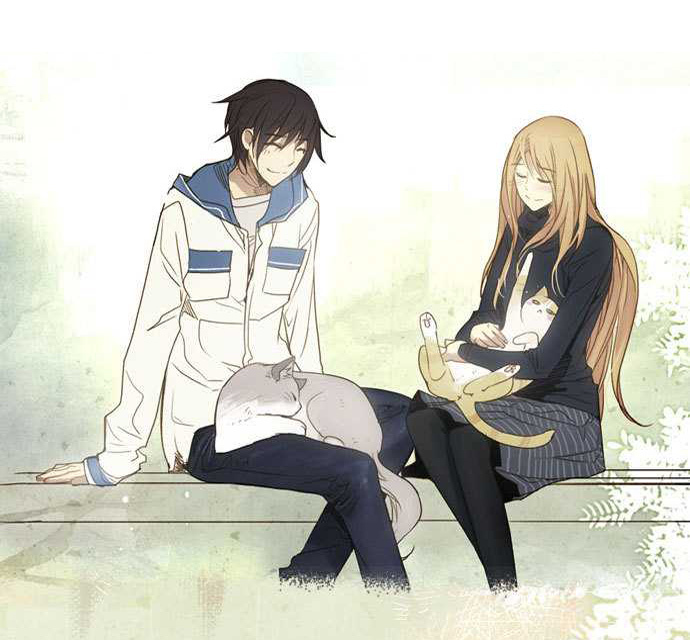 This is a sweet manhwa, like ridiculously so. It focuses on this girl Yun-lee who’s trying to find something to fill the missing gaps of 19-21 in her life. She’s supposed to be an adult with direction in her life, but she still feels like a teen. Now insert CATS! No seriously, she meets the main guy, Dong-hwi as he’s feeding cats. Progress the story, gotta save some cats. We watch the two become closer as she tries to grasp what she wants to do with her life. It’s actually a short manhwa so expect things to move along pretty quickly. The romance is cute, bare in mind it’s not the main aspect of this story, and the ending is really satisfying. It was definitely a cute and enjoyable read, plus you know, cats, so gotta love that. There was more attention focused on the cats then one would think, but I liked that. Fits with the story being more a slice of life than a romance. The artwork is colored and really freaking pretty….yes I started it for it’s art again, don’t judge me! but the characters were also really enjoyable. Yun-lee was cute and mature and forward about her thoughts. Dong-hwi was hilarious and so cute, I couldn’t. Give it a go if you like cats, cute, and cats.